A hacker who hijacked computers to make death threats has been jailed for eight years. 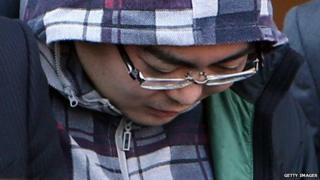 Yusuke Katayama played a game of cat and mouse with the authorities, leading them to make numerous wrongful arrests. He threatened a massacre at a comic book event, as well as to attack a school attended by the grandchildren of Japan's Emperor Akihito. Katayama's campaign highlighted the difficulties the country's police force has had in dealing with cyber crime. "He committed the crime, and the purpose of it was [for police] to make wrongful arrests," said presiding judge Katsunori Ohno at Tokyo District Court, adding that Katayama's actions had been "vicious". Throughout 2012, the 32-year-old used a virus to gain control of strangers' computers. He then issued threats - which appeared to come from the computer's owner - and a series of riddles that captured the attention of the national media. Among the other threats made by Katayama - who went by the alias Demon Killer - was one to attack a plane. The case highlighted the Japanese police's tendency to extract confessions from suspects, as four people owned up to crimes which the National Police Agency (NPA) later admitted they did not commit. Computers belonging to each had been infected with a Trojan Horse virus, introduced via a link on the popular Japanese chat forum 2channel. The NPA's chief apologised, acknowledging his force had been tricked by the hacker, and promising his cyber crime unit would improve. Police held one falsely suspected person for several weeks before media and a cyber crime expert received anonymous messages containing information that investigators conceded could only have been known by the real culprit. Katayama had taunted police in emails that sent them all over Japan. In one message, investigators were told to go to Enoshima, an island off Tokyo, and to look for a cat that turned out to be wearing a collar on which was a memory card. The card held details of the code and malicious program he had used to gain remote control of victim's computers. In December 2012, the police offered a 3m yen (£16,822) reward for information leading to the arrest of the culprit. But it was the cat that led police to arrest Katayama in February 2013, who was seen on CCTV footage with the animal.